The young waxing crescent moon should be much easier to spot after sunset this evening than it was yesterday. Yesterday, the moon shone closer to the setting sun, so the moon followed the sun beneath the horizon shortly after sundown. Tonight’s moon will be higher in the sky and will stay out longer after sunset. From our mid-northern latitudes, the lunar crescent sits low in the southwest sky at dusk and nightfall. Keep in mind that tonight’s moon will not stay out for long after dark. 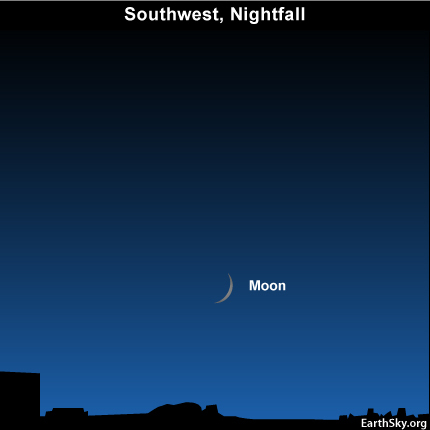 As seen from the southern hemisphere, tonight’s moon will be higher in the sky at sunset. Therefore, the lunar crescent will set later after dark in that part of the world. In both hemispheres, the moon travels an average 12 degrees eastward of the sun daily. (For reference, the moon’s diameter spans 1/2 degree of sky.) So why does the young crescent set later after sunset in the southern hemisphere? It is because it is now spring in the southern hemisphere, and autumn in the northern hemisphere. In the autumn of the year, the waxing moon travels mostly sideways in relation to the setting sun from day to day, so it sets a minimum time after sunset on autumn evenings. In spring, the waxing moon’s daily motion takes it most directly upward from the setting sun, so the evening crescent sets a maximum time after sunset in springtime. Wherever you may live worldwide, see if you can spot the young lunar crescent adorning the dusk and early evening tonight!